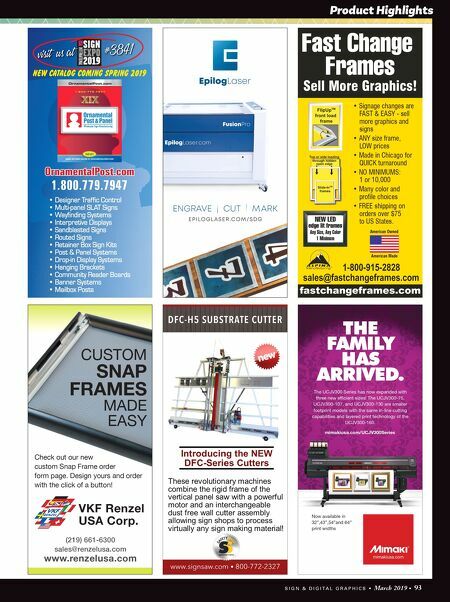 Product Highlights S I G N & D I G I T A L G R A P H I C S • March 2019 • 93 Fast Change Frames Sell More Graphics! • Signage changes are FAST & EASY - sell more graphics and signs • ANY size frame, LOW prices • Made in Chicago for QUICK turnaround • NO MINIMUMS: 1 or 10,000 • Many color and profile choices • FREE shipping on orders over $75 to US States. Manufacturing NEW LED edge lit frames Any Size, Any Color 1 Minimum American Owned American Made 1-22-19-EPILOG-SDG-6th.pdf 1 1/22/2019 4:11:37 PM The UCJV300 Series has now expanded with three new efficient sizes! The UCJV300-75, UCJV300-107, and UCJV300-130 are smaller footprint models with the same in-line cutting capabilities and layered print technology of the UCJV300-160. Now available in 32",43",54"and 64" print widths mimakiusa.com/UCJV300Series THE FAMILY HAS ARRIVED. CUSTOM SNAP FRAMES MADE EASY Check out our new custom Snap Frame order form page. 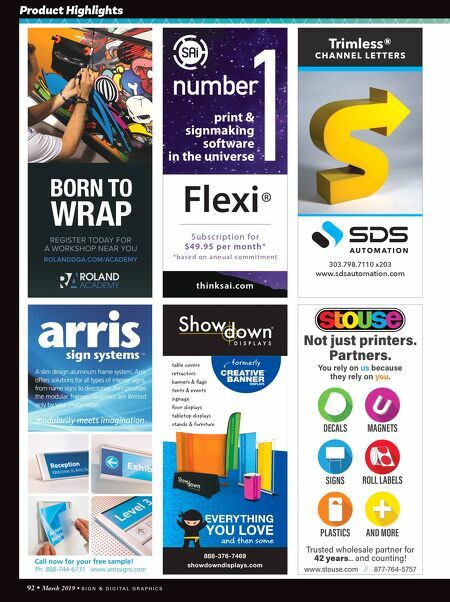 Design yours and order with the click of a button! (219) 661-6300 sales@renzelusa.com www.renzelusa.com VKF Renzel USA Corp.